Artificial intelligence is a branch of computer science, which uses visual perception, speech recognition, decision-making, and translation between languages, to make a machine intelligent without assistance of humans. Artificial intelligence techniques can be used for security management purposes to protect any system from security attacks or threats by warning the user in real-time. For example, Intrusion Detection System is a mode of security software that can automatically detect if someone is trying to hack confidential information through malicious activities or security policy violations, further alerting the user about the attempt to intrude data. Similarly, cryptography is a method of analyzing and transmitting data in a particular form that shares the data only with an intended user. Rampant advancements in technology and increasing use of 2G, 3G, and 4G Long-Term Evolution (LTE) wireless networks, along with the introduction of 5G mobile networks, are major factors driving growth of the global market for artificial intelligence based security. These cellular networks enable connectivity and communications to exchange real time information, data, and online transactions among other activities, which are prominent targets of cyber-attacks. . For instance, according to the Internet Crime Complaint Center (IC3), in 2016, cybercrimes resulted in losses of over US$1.33 billion, globally. This in turn, is expected to boost the demand for security solutions, thus boosting growth of the artificial intelligence based security market over the forecast period. Additionally, increasing smart city initiatives, globally, is also expected to fuel growth of the AI based security market. For instance, in 2015, Government of India launched ‘100 Smart Cities Mission’. Important elements of the smart city initiatives include digitalization and deployment of Wi-Fi hotspots at various locations. Public Wi-Fi networks are unsecured networks that use shared passwords. Hence, is exposed to threats such as malware, phishing, password breaches, and denial of service attacks. Increasing deployment of personal Wi-Fi facility is thus, expected to increase demand for artificial intelligence to detect any abnormal behavior at early stages. This in turn, is expected to fuel growth of the market for artificial intelligence in security. Moreover, according to F-Secure Labs, daily around 5000,000 samples of data are received from customer reporting around 10,000 malware and around 60,000 malicious URLs for analysis and protection. Analysis of large amounts of data is beyond human capacity, due to which, artificial intelligence is implemented. The banking and finance sector is witnessing significant changes due to adoption of IT solutions for improvement of banking services. Proliferation in online transactions and increasing use of services such as NEFT (National Electronic Fund Transfer), RTGS (Real-time Gross Settlement Systems), ECS (Electronic Clearing Service) as well as mobile transactions, is in turn, increasing the demand for secure solutions. Increasing number of payment gateways, e-Commerce websites, and mobile application that accept online transactions and store credit card and debit card information are also increasing the susceptibility to hacking. According to the Reserve Bank of India (RBI), during 2015–2016, 16,468 frauds associated with ATM, debit card, credit card, and net banking were reported. The number recorded in 2015, was higher than that recorded in 2014, accounting for 13,083 frauds and that recorded in 2013, accounting for 9,500. Due to this, an increasing adoption of Artificial Intelligence Based Security is being witnessed in the banking and finance sector. Artificial intelligence simply measures the relation between input and output variables, thus true insights on the problem and nature of the solution are not guaranteed. This poses as a restraint for growth of the global market of artificial intelligence based security. North America held a dominant position in the global artificial intelligence based security market in 2016, and is expected to retain its dominance throughout the forecast period. This growth is attributed to rising cyber-attacks in this region. U.S. accounted for the major market share in the region, owing to constant cyber-attacks on industries such as healthcare, banking and financial, and retail and manufacturing. For instance, according to the Internet Crime Complaint Center (IC3), in 2016, cybercrimes were valued at over US$1.33 billion globally, in which, California witnessed the highest recorded loss with over US$ 255 million. Additionally, in 2016, around 28% of web application attacks were recorded in the U.S., followed by the Netherlands and Germany. The market in Asia Pacific is estimated to exhibit the highest CAGR over the forecast period. This is attributed to rising adoption of machine learning and natural language processing technologies as well as increasing number of 5G pilot projects in the region. This in turn, is expected to boost the AI in security for application in the telecom industry. For instance, China Telecom Corporation Ltd. established a new 5G base station in Lanzhou on December 2017, to expand 5G pilot projects in China. This in turn, is expected to boost growth of the artificial intelligence based security market over the forecast period. 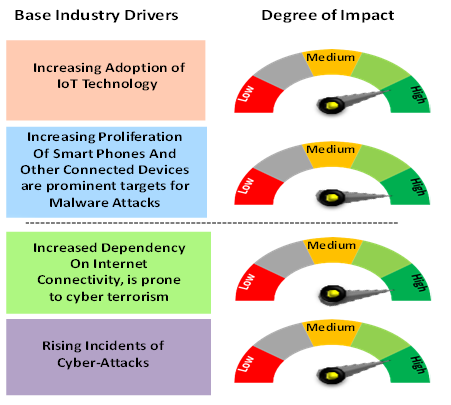 Major players operating in the global artificial intelligence based security market include Nvidia Corporation, Intel Corporation, Xilinx Inc., Samsung Electronics Co., Ltd., Micron Technology, IBM Corporation, Cylance Inc., Threatmetrix, Securonix, Inc., Amazon, Sift Science, Acalvio Technologies, and Skycure Inc. Artificial intelligence (AI) is group of methodology that focuses on formation of intelligent machines with the help of human intelligence such as visual perception, speech recognition, decision-making, and translation between languages. Artificial intelligence can also be utilized for controlling access to hardware, software, and data, along with protecting them from cyber-attacks and damage that may be caused through the Internet, data, and code injection. Increasing adoption of Internet of things (IoT) is expected to drive growth of the global artificial intelligence based security market. Internet of things is used to protect and secure the network connecting IoT devices to back-end systems on the Internet. IoT security authenticates an IoT device by managing multiple users of a single device platform. Moreover, it ranges from simple static password or pins to more robust authentication mechanisms such as two-factor authentication, digital certificates, and biometrics. For instance, according to IHS Markit—a database provider—15.4 billion IoT connected devices were reported in 2015, across the globe. A unique technology called ‘User Pre-Shared Key’ (UPSK), is used for every device within the network to ensure IoT device security. .
IoT technology also aids in connecting the physical and digital world. It can track objects, collect data, analyze it, and take required action. It can also be used to monitor activities of an object along with its progress in a specific time period. Key companies covered as a part of this study include Honeywell International Inc., Aavid Thermalloy LLC., Vertiv Co., European Thermodynamics Ltd., Master Bond Inc., Laird PLC, Henkel AG & Company KGaA, Delta Electronics, Inc., Advanced Cooling Technologies, Inc., Dau Thermal Solutions Inc, and Amerasia International (AI) Technology Inc.
*Browse all the market data tables and figures on "Artificial Intelligence Based Security Market - Global forecast to 2025”.